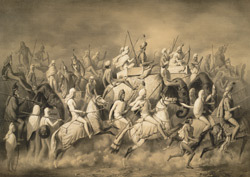 Lithograph of Sher Singh the Maharaja of the Punjab and his entourage out hunting on elephants and horses in the vicinity of Lahore in Pakistan by L.H. de Rudder (1807-1881) after an original drawing of March 1842 by Prince Aleksandr Mikhailovich Saltuikov and published in Paris in 1848. After the death of the Mughal Emperor Aurangzeb in 1707, Lahore went through a turbulent power struggle that finally culminated in 1799 when Ranjit Singh captured the city for the Sikhs. Ranjit Singh (ruled 1799-1839) became the first Sikh ruler of the Punjab at Lahore. He is remembered for the architectural additions that were made to the city in his reign and as the unifier of Sikh Punjab. Following Ranjit Singh's death in 1839, the struggle for control over the Sikh kingdoms was between the Sikh aristocracy and the British. Sher Singh, the second son of Ranjit Singh, ruled from 1841 to 1843. In 1849 Lahore was officially in British control.